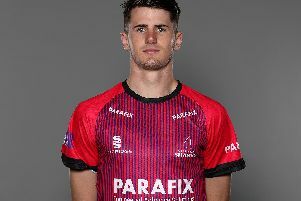 Tom Johnson was Man of the Match with 62 to help Horsham lift the Gray-Nicolls T20 Cup at the County Cricket Ground in Hove. They beat Middleton by 53 runs to win the Sussex knock-out competition for the 13th time. Having won the toss, Horsham batted and made 161-5 in their 20 overs. Tom Johnson masterminded the Horsham innings by hitting his 62 in just 32 balls and featuring four huge sixes. Middleton in their reply ended up well short of their target on 108-9. Horsham’s win was based on a great start to their batting as they reached 90-0 in the ninth over thanks to a fine opening partnership by Tom Johnson and Will Beer (26). After Tom Johnson got out, Beer followed the next ball as Middleton’s Jamie Thompson took three wickets in four balls. As wickets tumbled, Horsham’s rapid advance slowed and the game looked like it might become competitive as they slipped to 99-4 off 12 overs. However Michael Thornely continued the push by scoring an unbeaten 47 and shared in a 29-run stand with Thomas Haines (13) and an unbroken 36-run stand with skipper James Johnson for the fith and sixth wickets. Playing in the final for the second successive year, Middleton could not cope with Horsham’s bowling attack, and slipped to 35-4 and then 71-7 as Johnathan Whiting took 3-21, George Garton took 1-0 and spinner Michael Munday took 2-17. Middleton’s reuired run-rate increased from 12 per over with eight to go to an unlikely 24 per over from the last three. Although Thompson hit a late 21, the Horsham target proved too much as Middleton kept losing wickets and overs left to bat.